We've had smartphones and the smart home but nothing is going to come close to Hozelock's idea for the smart garden launching early next year. 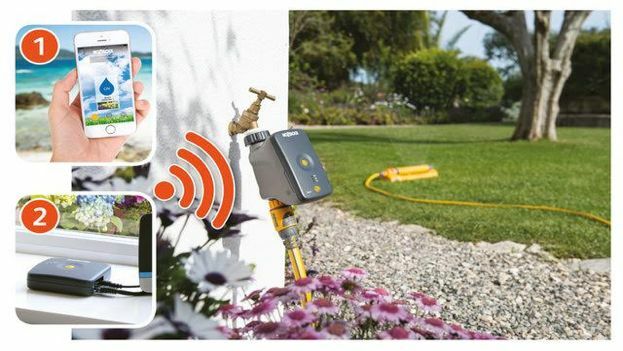 The hose and all round watering specialists have a couple of ideas that will blow gardener's minds including a controller that switches on the sprinklers when you're not even in the country and customisable sensor controllers. Heading up the range is the Hozelock Cloud Controller that when paired with a smartphone and app takes control of your hosepipe. The kit is powered by a low-power, long-range radio that connects to the internet and allows the user to turn on the watering at any time or simply create a schedule. It can even plug in to local weather data and change the watering pattern accordingly. Complementing the cloud controller are two different sensor controllers that adjust to the time of the day. The Sensor Controller is ready to go straight out of the box and contains sensors that adjust to the time your garden needs to be watered. As the user, all you need to do is turn the dial to dawn, dusk or both and then adjust the duration of the watering to anywhere between two minutes and an hour. The Sensor Controller Plus, meanwhile, has all the features of the regular Sensor Controller plus a range of additional frequency adjustments from daily to once a week. Hozelock has also debuted a new Easy Drip automatic watering system that makes it incredibly easy to water the entire garden at a consistent level. The Cloud Controller is priced at £114.99, the Sensor Controller costs £35.99 or £44.99 for the Sensor Controller Plus and Easy Drip kits start at £32.99. All the products are slated to go on sale in January next year.